Part of the stock car racing history of New York state is its earliest part – the jalopy / roadster era. Chat sites and other web sites are full of anecdotes on tracks from around 1950, battling with the Attorney General and the New York State Police about their right to stage races in the face of the profound dangers and of the disruption such early tracks often caused in their neighborhoods. When one considers such places as Satan's Bowl of Death, Jamestown, NY - it isn't entirely impossible to understand why a good - sized segment of the post - WWII population wasn't very enthusiastic about such noisy, dangerous goings - on. laws were also hammering tennis, circuses, and more. Just to touch briefly for those not familiar, the first stock cars in New York were not the stock cars we generally think of – the coupes and the sedans. The first racers were variously called jalopies, roadsters and even mud buggies. They were usually roofless old Model T's and the like, almost devoid of safety equipment of any kind. Seated high up on a seat that usually did not have a seat belt, the often helmetless driver would fly around a dusty, bumpy track at pretty fast speeds, his grip on the wheel the only thing keeping him in [or more appropriately on] the car. There were traces of this kind of racing that were cropping up in the early 1940's, only to be interrupted by World War II. Besides such great venues as the aforementioned Satan's Bowl of Death, there was also racing activity as far away as in eastern New Hamphire, around the Portsmouth/Dover area, where the jalopies there were generally labeled as "mud buggies'. Future prominent New Hampshire stock car and supermodified promoter Charlie Elliott raced one of thse mud buggies at that time. Such racing seemed to be best known in central New York, around the Perth, NY area, and in the Capital District. The tracks don't matter because this is not about them. There was another small sector of this early racing to the North. Although Corinth, McGregor, and other speedways weren't that far away, this circuit seemed to mostly spawn its own fields of entries. like Seneca Falls Speedway [below] were some of the earlier tracks. The old Warrensburgh fairgrounds were one venue for some early roofless racing; but, it was too far north to be able to sustain itself alone. Two other, less known tracks would spring up to form an informal circuit. Trout Lake Speedway was the poster child for what I call an informal track. Located in the town of Bolton Landing, it was way out in the wild, beside Trout Lake. Very little is known of the races there; and – as far as I can ascertain – no photos or documentation exist. The third track was, in many ways, the most organized. 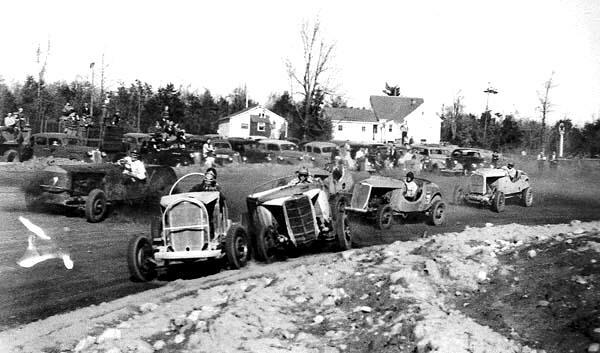 A track built specifically for auto racing, Elwin Swinton's Champlain Speedway was unusual for the time in that it had property border fencing, bleachers, specific outbuildings, and a good spectator protection fence. Fortunately, this track has some materials to help us understand and appreciate it – thanks to Joan Swinton Walker, daughter of the owner. much more than an oval in the woods off a back road. As I stated, there is simply nothing on Trout Lake, and about all of the materials people have on Warrensburgh is from when it ran stock cars. Warrensburgh, is however, the only one of the three tracks to survive. This mostly in due to the fact that – when the dung hit the fan about roadster racing in New York, Warrensburgh went over to just stock cars. It would go one to stage races until around 1960. Clippings that center around the Ticonderoga – based Champlain track give us insight into this circuit. It is not clear on which days each track ran, but we get a good picture of the most organized of the three tracks from these clippings. While many, many of the Champlain teams came right from within Ticonderoga, it is clear that there were regular participants from other surrounding towns and from some communities a long way away. I can only assume that, while each track probably had some cars exclusive to just them, that many of the teams mentioned in the Champlain writeups would race at the other two venues, as well. and roadsters before wisely settling on stock cars in the '50's. Champlain, in particular, was involved with a group called the Adirondack Racing Club. Leo Wells, of Hague, NY drove a car called the Miss Ticonderoga. [A unique thing here was that a lot of the cars had names much like the old Indy cars]. Ticonderoga garage owner Irv Rooker fielded a roadster that was successful with a few different drivers; but Almon “Al” Belden of Ticonderoga seemed to be the main chauffeur. Ernie Duquette was another driver often mentioned. Champlain, unlike Trout Lake or Warrensburgh [sometimes called Ashland Park] would run a mix of the roadsters, along with some regularly – attending open wheel three quarter sprinters, and even a few roofed stock car coupes. The tracks placed a great emphasis not times during races, more than track position. Time trialing was a big deal. star, poses for the Swinton family camera. 90 year – old South Burlington, VT native Jack Peterson likes to tell stories of “that track down in Ticonderoga”. Most of his stories involve stiff competition with a few other open wheel guys over lap times. The famed Soper family of BouquetValley, NY would run at Champlain, being regularly joined by Peterson, Art Prairie [better known as a flagger at Airborne and Saranac Lake], and Albany – based Kenny Gallop who usually drove Eddie Elliott's car out of Fair Haven, VT.
around 1950. 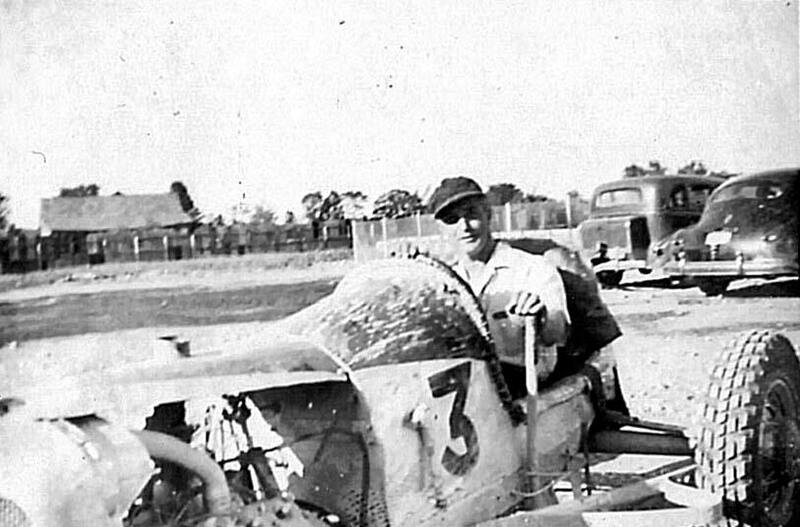 Below – Jackie Peterson poses with his open wheel car at Champlain. The fields at Champlain – while heavily from Ticonderoga, did include drivers from area towns like Tawahus, Crown Point, Hague, Moriah, and Bolton's Landing. However, the newspaper articles made a big point of the fact that Champlain attracted teams from a number of other locations. The legendary Bob Whitbeck was mentioned, as was Menands' Del Moak, with his Deep Six roadster. It has recently been mentioned that this might have been the firs mechanical project in which Cliff Wright was involved. Moak was often racing at Burden Lake Speedway. Other Albany – area drivers who invaded Ticonderoga were Jim Cox and Eddie Webb – both of Rensselaer. 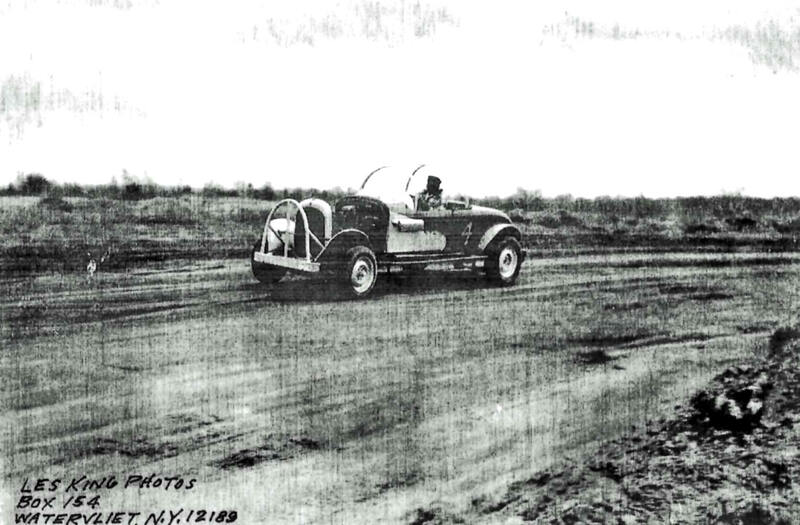 Although there is specific mention of the great roadster driver Art Pratt, it is almost certain he would have towed up from Corinth and competed before leaving the region to drive a sprint car in the Midwest. Local drivers, however, more than held their own with the outsiders. Top finishes in heats and features often list names like Smiley Hogan, Jack Wells, and Roland Swinton all of Ticonderoga: “Doc” Otis, of Lake Placid; and Ed Dukette. poses with an open wheel car. He drove these and roadsters. A unique thing to Champlain was the fact that some of their regular drivers would sometimes double as stunt drivers – riding on the hoods of cars through fire and other feats. The track did have a regular troop of stunt drivers out of Canada headed by Les Rogers. Ted Bruno, who drove both open wheel cars and roadsters at the track, also tripled as the lead hell driver at times. It sort of reminds me of Joey “Beserko” Becker, performing something of a stunt performance for the folks at Thunder Road. A related article mentioned AAA races being run at the Rutland Fair, which featured big names like Bill Holland, Lee Wallard, Ted Horn, Tommy Hinnerschitz, and Joey Chitwood, Sr. Champlain regulars Jack Peterson and Kenny Gallop would be very apt to not only go to these local shows, but they would qualify. Henry Gritzbach, who had competed at Warrensburgh in a sprinter was another man running the fairs, as well as car owner Rollie Johnson [father of Jack and Joe Johnson]. he would do in the car for a performance. Champlain is known to have run in 1949 and 1950. After that, I cannot be certain it still ran. Pressure from the New York State government closed most roadster track by 1951. The breaking point seemed to be when the prominent Art Pratt turned his roadster over to a young mechanic who was killed in one of his first races, widowing a wife and leaving small children without a father. No matter when it closed, Champlain Speedway suffered the unusual fate of soon being overrun by the waters of the lake after which it was named. 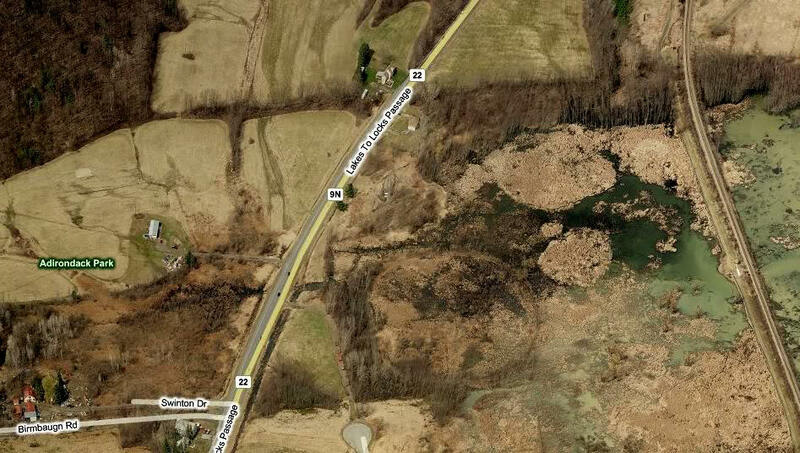 No one in the Swinton clan seemed to know if Elwin had to take measures with the water while he had the track open, but the only way to discern track location now is via aerial views. The track was almost a perfect circle and trees around it are easy to spot in the wetlands. With the disappearance of the entire circuit, stock car racing took over, while Peterson and the other open wheel guys sought other places to run. There was some sparse opportunities in Vermont, followed by Peterson turning to a successful stock car career. The Sopers barnstormed around to find places to run. From the familiar names appearing in Champlain Speedway articles, almost none went on to race in the future. Bob Whitbeck and Cliff Wright, of course became legendary car builders and owners. 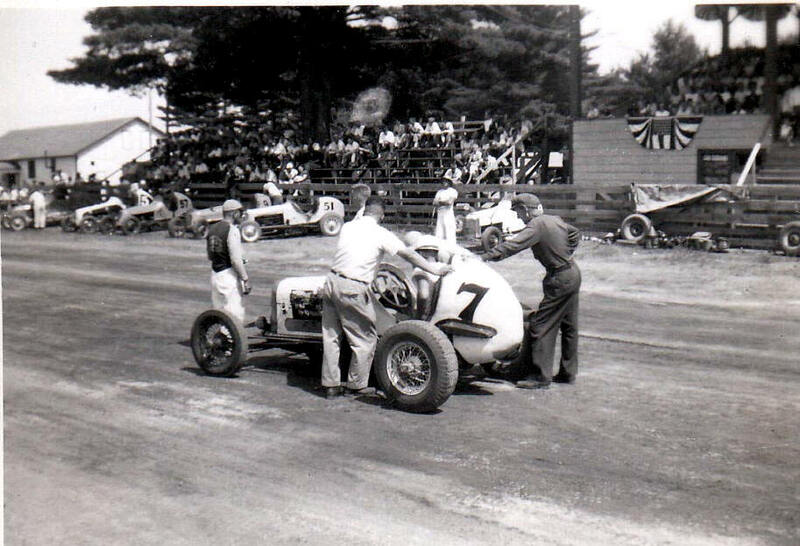 Of the roadster brigade, I cannot think of a single man who continued on into stock cars except occasional runner Smokey Stover, from the Saratoga area, who had helped found McGregor Speedway in Wilton and who raced a little up to the mid 1950's. McGregor Speedway, plies a roadster on the rustic Wilton track around 1951. He would dump the car upside down later this day. The biggest shame is that Champlain Speedway, a really nice facility just disappeared entirely [along with Trout Lake]. Warrensburgh soldiered along with stock cars for years longer. It was a chapter in racing history that begs more research.